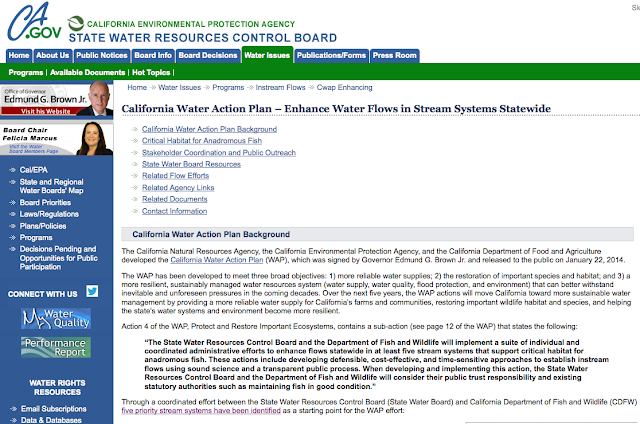 The Ventura River has been identified as one of five priority streams in the California Water Action Plan (WAP.) The State Water Board and CDFW are currently working to identify potential actions that may be taken to enhance and establish instream flow for anadromous fish in these five priority streams. The streams identified for the WAP effort are primarily coastal streams where the survival of salmon and steelhead (together referred to as salmonids) are of particular concern. Of the 22 distinct groups of anadromous salmon and steelhead in California, 13 (59%) are in danger of extinction and are in need of enhanced protection. The Ventura River provides an opportunity to advance state water management policy by integrating groundwater and surface water management for the first time. On March 28, 2016, a team representing the State and Regional Water Resources Control Board and California Department of Fish and Wildlife toured the watershed.